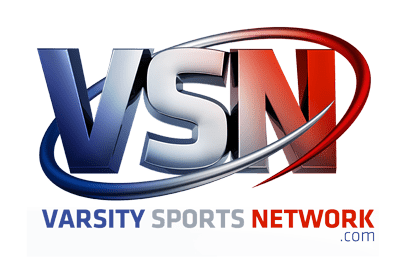 The McDonogh baseball team celebrated a rare appearance in the VSN Baseball Top 20, as they debuted on Monday at No. 20, with a 10-2 rout of No. 6 John Carroll, on the road in Bel Air, behind the crafty offerings of senior lefty Matt Spind. Not only did the victory justify the Eagles standing as ranked squad, it valued them into contention for a top seed in the chase for the MIAA A Conference playoffs. With the win McDonogh (9-6 overall) improved to 6-3 in the league, tied for third-place with Mount St. Joseph and just a half game behind second place Gilman (7-3). This is certainly rarified air for a McDonogh program which has never won an A Conference baseball crown and usually watches the post-season from afar. Spend, who has committed to play his college baseball at Bates College (ME), is not over-powering but he has mastered the art of pitching, with an effective use of changing speeds and pitching to spots. On Monday, he scattered eight hits and walked just two in a complete game effort, in which the Patriots managed just a pair of runs, only one of which was earned. Spring struck out five and needed just 85 pitches to finish the game. McDonogh leadoff hitter Everett Cooper stroked a triple, drew three walks and scored two runs to set the table for the Eagle lineup. The Eagles broke on top 2-0 with back-to-back RBI doubles by Cory Kowitz and Ben Smith and added four more in third to build a commanding 6-0 advantage. Logan Lach produced the first his three RBI’s with a double in the third and later scored on a two-run single by Kyle Whitaker. Evan Hertzberg plated the final run of the inning with a sacrifice fly. John Carroll got its first run in the bottom of the third as Johnny Gallant reached with a leadoff single moved to second on a single by Chris Roberts and was sacrificed to third, before Tyler Blittersdorf plated him with an infield grounder. Lach got his second RBI with a sac fly in the fourth and added another sac fly in the in the sixth. Also in the sixth, after two were down, Spind reached base on a dropped third strike and the bases were then loaded with a walk. With Whitaker at the plate, Brian Nevin scored on a wild pitch as the Eagles’ lead grew to 10-1. John Carroll added an unearned run in the sixth and Spind, despite allowing a one out double in the seventh, closed things out with little stress. McDonogh also defeated John Carroll last Wednesday in Owings Mills and the Patriots have now lost three straight and have slipped into seventh place. If the A Conference playoffs were to start today, the Patriots would find themselves on the outside looking in. The good news for the Patriots is that only first-place Calvert Hall (9-0 in league play) has established itself as a dominant force. The next seven teams are separated by three games or less in the loss column. Gilman currently sits in second place with a 7-3 mark. Loyola (4-4) and Archbishop Spalding (5-5) sit just back of McDonogh and St. Joe, while John Carroll (10-5 overall, 4-5) and defending champion Archbishop Curley (4-6) remain very much in playoff contention. Another big day looms on Tuesday in the league. McDonogh will put its three game winning streak on the line when it hosts Curley. Calvert Hall will visit Gilman in a battle between the top two teams in the standings, while St. Joe visits St. Mary’s, St. Paul’s travels to Loyola and John Carroll ventures down to Spalding. 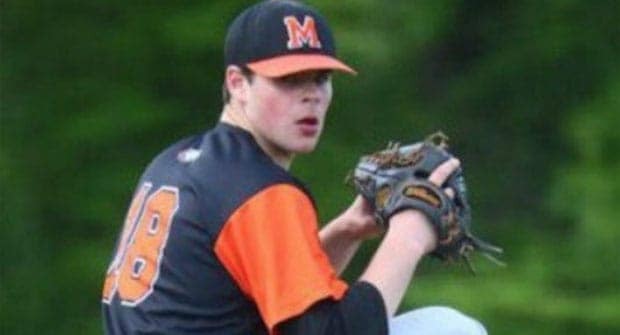 Pictured above: McDonogh’s Matt Spind defeated John Carroll, 10-2, with a complete game effort. His Eagles are ranked No. 20 and tied for third in the MIAA A Conference.